Chandigarh 28th October:– Giving the nation builder teaching community a Diwali bonanza, the Punjab Deputy Chief Minister, Sukhbir Singh Badal today distributed appointment letters to 4560 Teachers of master cadre and 2005 teachers belonging to ETT cadre. In a function organized here by the Education Department, Punjab, the Deputy Chief Minister congratulated and profusely appreciated the go-getter efforts of the Education Minister, Punjab, Dr. Daljit Singh Cheema and the entire department for this stupendous effort. He said that it is a very big and prestigious responsibility to be a teacher who shoulders the responsibility to mould the future of the nation. That explains why, said the Deputy Chief Minister, the emphasis of the SAD-BJP government is to invest more and more into the educational sector. Disclosing more, he said that during the course of previous 9 years the state government has provided 2.50 lakh jobs in various departments in a transparent and fair manner. Divulging more, he said that during the next month nearly 30000 more contractual employees would be absorbed in the various departments as it is the prime endeavor of the state government to fill vacancies in all departments as soon as possible in order to make process of governance more faster. Making a strong pitch for development, Sukhbir Badal said that the SAD-BJP government has taken path breaking innovative measures in various sectors which includes surplus and cheapest power, excellent road infrastructure, sewerage and clean drinking water in 100 cities with 60 more to follow, preservation of culture in the form of construction of memorials belonging to all religions and beautification of all religious places. He also said that whatever the government has said it has accomplished. He also announced that in the next 5 years all the 12000 villages of the state would be equipped with sewerage facilities at a cost of Rs. 35000 crore. Earlier, welcoming the Deputy Chief Minister on the occasion, Dr. Daljit Singh Cheema said praised the vision of the Chief Minister Parkash Singh Badal and the Deputy Chief Minister which enabled the education department to fulfill it's target of 22000 recruitments. Congratulating all the teachers, the minister said that during the previous 9 years the education department has recruited 84000 teachers. He also divulged that the teachers have been selected after a rigorous process encompassing Teachers Eligibility Test and Subject and Aptitude Test. Making another significant announcement, Dr. Daljit Singh Cheema said that the stations to the newly appointed teachers would be allotted as per merit on the 3rd and 4th November. 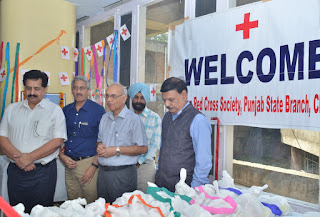 Chandigarh 28th October:– As part of Diwali celebrations Indian Red Cross Society, Punjab State Branch distributed blankets to the poor patients and fruits to the indoor patients of P.G.I. The social workers distributed 500 packets of fruits to the admitted patients of Gastroenterology, Advanced Urology Centre, Male Surgical Ward, Female Surgical Ward, Gynae Ward, Maternity Ward and ICUs. Prof. S.C.Verma, Director PGI and the Chief Guest inaugurated the fruit distribution function organized by Punjab Red Cross on the occasion of Diwali. He lauded the efforts of the lady social workers by way of distributing medicines and other relief amenities to the poor & needy patients of PGI. C.S.Talwar, IAS (Retd), Secretary of State Red Cross encouraged the social workers who are doing selfless service by devoting time & money for the welfare of the patients. Harbans Kaur Oberoi, Honorary Secretary of Punjab State Red Cross (Hospital Welfare Section) and her dedicated team of ladies including Ms Raji wished the patients Happy Diwali and speedy recovery. Dr Vipin Koushal acting Medical Superintendent, Dr R.K.Sharma, Head Dept of Plastic Surgery and other PGI staff were also present on the occasion. Chandigarh 28th October:– The general public hereby has been informed that the office of Registering & Licensing Authority, Sector-17, Chandigarh will remain close on 29.10.2016 (Saturday) and the work of registration of vehicle will be carried out in the office of Registering & Licensing Authority (Main Office), Sector-17, U.T., Chandigarh from 01.11.2016 (Tuesday) till further orders due to renovation work in SDM (East), Industrial Area, Phase-1, Chandigarh. Chandigarh 28th October:– In view of the Diwali Festival and anticipation of a large number of emergencies due to cracker injuries, Advanced Eye Centre, PGI has made elaborate arrangements to meet emergencies and provide immediate treatment to the patients reporting to the PGI. The department has put doctors on special emergency duty round the clock at the Advanced Eye Centre, PGI, Chandigarh from the morning of 29th October (8 AM) till the morning of 31st October, 2016 to attend to patients on arrival. Chandigarh 27th October:-- Lions Club Chandigarh Prosperity and Sai Tara Ummat Foundation in association with Forest and Wild life Department Chandigarh organized a Green Diwali Campaign at Sector -17 Plaza Chandigarh which was graced by the esteemed presence of Home Secretary Chandigarh Administration Anurag Aggarwal, as Chief guest, Mayor of Chandigarh Arun Sood as Guest of honour and Chief Conservator, Forest & Wild life Deptt., Santosh Kumar IFS as guest of honour. Dr. Deepti Shastri welcomed the Chief guest with bouquet Plants were provided by the Forest and Wild life Deptt. Approximately 1000 Saplings were distributed among people by the distinguished guests and members of the Lions Club and Sai Tara NGO as a part of this late evening campaign. A play was also organized to convey the message of Green Diwali to save the environment. Senior members of the Lion club motivated the general public by showing placards, Banners, and by counseling the people to celebrate Green Diwali and say no to crackers to save the earth from green house gases. 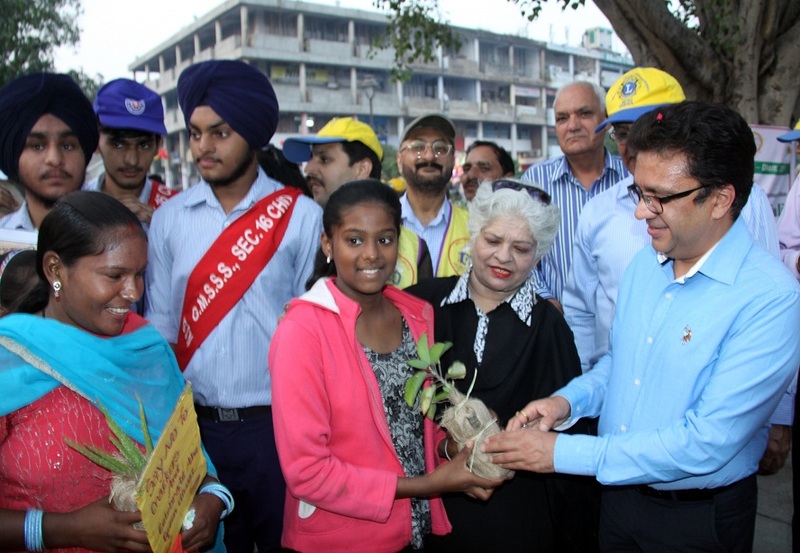 On this occasion Lion Deshraj Thakral, President Lions Club Chandigarh Prosperity said that this small effort can bring big changes and we can give green future to our younger generation. He appealed the people to adopt "Each One Plant One" approach on this holy festival. He stated that safe environment is must for the healthy life for all of us and crackers add many dangerous elements in the air. Firing crackers are just making our life bitter intentionally. He also stated that Diwali must be celebrated by keeping our traditional ethics and moral values in mind. He stated that Each one should gift plants to others on this Diwali. Dr. Deepti Shastri, Chairperson, Sai Tara Ummat Foundation (NGO) praised the idea of organizing this much needed campaign to aware the people of the tricity towards the environment. She further added that it's a great move and I strongly feel such awareness will make people more responsible and realize how important this earth is to us. More than talking we should work towards it. If we fail to act now then it might be too late when we really think to do something. She insisted that everyone should contribute their best towards saving the earth, after all this is our home and it should remain a safe place to live for our future generation also. Lion R.K.Rana, Past Distt. Governer Lions Club Distt. 321- F, mentioned that this task can never be completed with drives and campaigns but each one of us must be serious enough to adopt these things as habits. He also stated that in saving this environment, we have miles to go in making this earth a better place to live.He also paid his gratitude for the cooperation of Chandigarh Administration and Forest deptt. And thanked to Home Secretary, Anurag Aggarwal and Mayor Arun Sood for gracing the occasion. He also complemented to Chief Conservator, Forest and wild life Deptt. Santosh Kumar, IFS, for extraordinary support and cooperation for this noble cause. Chandigarh 27th October:-- Spreading message to celebrate 'Green Diwali', the tiny-tots and their parents gathered at Eurokids preschool, Sector 37-D to celebrate Diwali with great zest and zeal today. 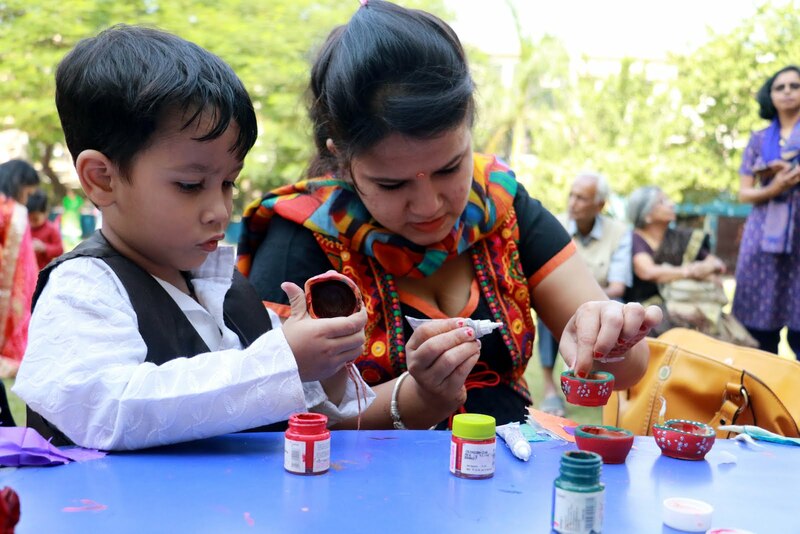 The celebrations were organized to highlight the need for a 'cracker-free diwali' and also give tiny-tots an opportunity to exhibit their creative talent. The host of creative activities was organized to spread awareness about celebrating a 'green diwali'. Kids displayed creativity designed placards saying "no to crackers" and "yes to green Diwali". Their parents also joined them in this effort by pledging to have a smoke-free Diwali. Meanwhile in tune with Eurokids tradition to foster strong family ties, a 'Kiddie Diwali Fete' was the main event during program where mothers and children dressed-up traditionally to give festivity to the event. Mothers showed their talent in making of diya, candle, sweets and rangoli. The tiny tots took part in different activities with their educators and parents, To give a feel of how diyas are made , a potter's wheel was installed in the campus. A potter showed how lifeless clay took shape into a diya which was a mesmerizing experience for the little ones. Chandigarh 27th October:-- In view of coming festival season the Food Safety & Standards Department of Chandigarh Administration, Chandigarh appeal to all the resident and consumers to remain cautious and vigilant while purchasing sweet meats, bakery products, beverages, dry fruits etc from market. They should ensure that the food items they purchase are to be purchased from the license shops which observe complete hygiene and use quality products, so that there would be no harm to their health. In case any of the consumers observe/ see anything abnormal, he may ensure the quality report. The matter to the department of Food Safety & Standards, Govt. Multi Specialty Hospital, Sector 16, Chandigarh or at emergency phone No. 102. Similarly the Food Business Operators, the manufacturers and distributors dealing in the aforesaid food items are also instructed to observe the complete hygiene while preparing and dealing in these food articles and to act as per the provisions of Food Safety & Standards Act, 2006 in letter and spirit to avoid any untoward incident. Prompt and appropriate action under the law would be initiated by the enforcement officers i.e. Food Safety Officers of this office as and when required. Chandigarh 27th October:-- The 4th International Festival of Performing Arts hosted by Ryan International School, Chandigarh concluded with the presentation of musical performance by more than 1600 students of the school. The aim of this two day festival was to create a bond between various cultures across the globe. This Mega Event had the children performing the Finnish, Latvian; Egyptian & Zimbabwe dance forms that mesmerized the audience. The highlight of the program was presentation of Ballet- 'Brighter Tomorrow' based on Nirbhaya Case. This Ballet hit the emotional cord of the audience. It showcased beautiful expressions of pain, anger, desperation & fright. It depicted the entire journey of the life of women. The Ballet ended on the positive note of the Women Empowerment. Performance on the theme 'Peace' by the Latvian choreographer highlighted its importance of peace in today's hectic life. Drums of India took the audience in the world of sound, symphony and synchronization. Vibrant colors of India, the Finnish dance created the National Symbols using huge props that left all the guests spell bound. The Egyptian Dance celebrated the freedom & empowerment to women. Besides, the prayer dance took them into the spiritual world and "Vande Matarm Dance" evoked the feeling of patriotism and when the huge tri color covered the stage the packed house applauded the performers.